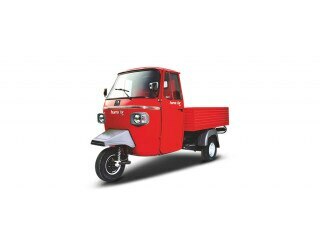 Feb 5, 2019: The Lohia Humsafar Cargo is one of the many three-wheeler mini pickup trucks that you will see plying on the roads. It has a gross vehicle weight of 950 kilograms and the wheelbase is a good 2,000 mm. The box body of the mini truck is built on the monocoque platform and the cabin has a D+1 setup. It is suspended over dual action hydraulic telescopic shock absorbers in the front while the rear has independent suspension. Hydraulic brakes do the braking duties. At the heart, there is BS-III compliant, 0.4-litre engine that can churn out a 10 bhp of maximum power at 3,500 rpm along with a peak torque of 20 Nm, which comes at just 2,400 rpm. A 4-speed manual transmission gearbox sends the produced power to the wheels. It can go up to a maximum speed of 70 kmph.